If you live in (or are planning to visit) any of the following locations, and if you’re a fan of soft serve ice cream machines and gourmet chocolate, you’re in for a huge treat! Alberta (Canada), Alabama, Arizona, California, Connecticut, Delaware, Florida, Georgia, Hawaii, Illinois, Indiana, Kentucky, Louisiana, Massachusetts, Maryland, Michigan, Minnesota, North Carolina, New Jersey, Nevada, New York, Ohio, Oregon, Pennsylvania, Puerto Rico, Rhode Island, South Carolina, Tennessee ,Texas, Virginia, Washington, Wisconsin. Much to the excitement of chocoholics and soft serve ice cream machine fans, GODIVA Chocolatier has installed soft serve machines in some of its boutiques in the abovementioned locations! And the soft serve ice cream that is being served to customers is to die for. The ice cream that is created in GODIVA’s soft serve machines is, without a doubt, premium, creamy, and luxurious – much like the other chocolate treats the company has been creating and selling for decades. Even though there are more than 500 GODIVA boutiques located in 80 countries around the world, fewer than 150 of the company’s locations are currently offering frozen treats that are created and dispensed from in-store soft serve ice cream machines. Specific boutiques in the regions listed above that are participating in the soft serve ice cream machine deliciousness can be found on GODIVA’s website. GODIVA boutiques sell gourmet chocolates that are beautifully-displayed behind glass showcases, and many locations offer a glimpse into the wonderful world of how perfect-looking chocolate-dipped strawberries are made. In fact, people passing the window of a GODIVA boutique are often drawn in to the store by the mesmerizing effect of the boutique’s chocolate displays. 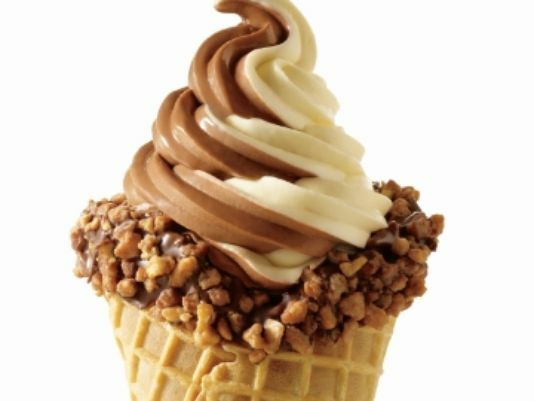 Images of the products produced by GODIVA’s new soft serve ice cream machines are enough to make a person’s mouth water. And as sad as it is, anyone not living in or able to visit one of the locations where a GODIVA soft serve machine exists is missing out on the ability to snack on this fantastic-looking frozen treat. The recent addition of GODIVA’s Soft Serve demonstrates the chocolatier’s continued commitment to providing innovative and unforgettable premium chocolate products that consumers can enjoy in new ways every day. Years ago you made ice cream bars and I think also cones that were sold in grocery stores. Then you discontinued all ice cream. I see that you now have soft serve cones in some stores. Have you also started making the ice cream bars and cones to sell in grocery stores, and if so, where are they available?